"A faultless romantic epic." Curzon Artificial Eye has revealed an official UK trailer for the award-winning Polish film Cold War (or Zimna Wojna), which first premiered at the Cannes Film Festival in competition this May. Cold War is the latest from acclaimed Polish filmmaker Pawel Pawlikowski (The Woman in the Fifth, Ida) and he also won Best Director in Cannes. The film is about a passionate love story between two people, who are fatefully mismatched. Wiktor, played by Tomasz Kot, falls for Zula, played by Joanna Kulig, and they spend years drifting together and apart. Set against the background of the Cold War in the 1950s. The cast includes Borys Szyc, Agata Kulesza, Cèdric Kahn, and Jeanne Balibar. The two leads are stupendous, some of the best performances all year, enhanced by gorgeous B&W shots by Pawlikowski's DP Lukasz Zal. This lovely trailer provides a preview of some of the mesmerizing jazz music from the film. Cold War is a passionate love story between two people of different backgrounds and temperaments, who are fatally mismatched and yet fatefully condemned to each other. Set against the background of the Cold War in the 1950's in Poland, Berlin, Yugoslavia and Paris--the film depicts an impossible love story in impossible times. 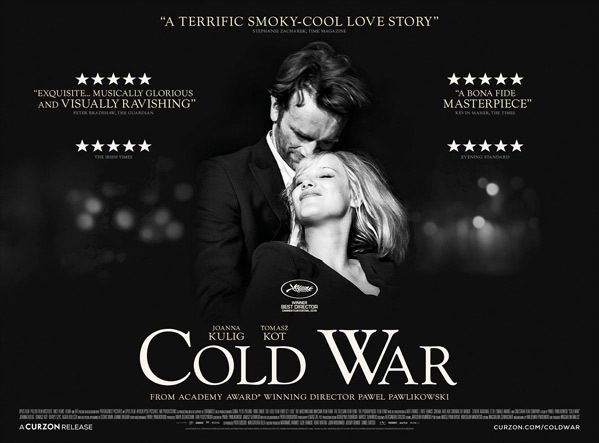 Cold War is directed by acclaimed Polish filmmaker Pawel Pawlikowski, director of the films The Stringer, Last Resort, My Summer of Love, The Woman in the Fifth, and Ida previously. The screenplay is written by Pawel Pawlikowski & Janusz Glowacki, with the collaboration of Piotr Borkowski; based on a story by Pawlikowski. This first premiered at the Cannes Film Festival this year, where it won the Best Director award. Curzon Artificial Eye will release in UK cinemas at the end of August. Amazon Studios will release Pawlikowski's Cold War in select US theaters starting on December 21st this year. Intrigued?